Part worn tyres are a great solution for saving money as they are a fraction of the price of new tyres. 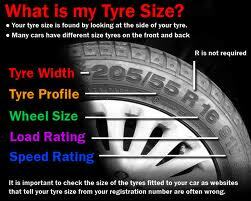 You can replace a tyre or a whole set of fitted tyres in some cases for a third of the price of buying new. Part worn tyres are not only cheaper than new tyres but they're also environmentally friendly too. If you would rather have new tyres fitted then that's not a problem, we stock most makes and popular sizes and those that we don't we can get quite quickly from our suppliers. We supply tyres from budget to high end specialist rubber. Please note: It's illegal to have insufficient tread on your tyres and you can expect to receive 3 points on your license for each tyre that's not road worthy. Tyre trad and stopping distances: It's important to realise that a poorly worn tyre has very little stopping distance, making your car a potential safety hazard not just to yourself but other motorists. To see what we mean, watch the video made by 5th Gear on the subject of tyre wear and stopping distances. It's quite an education.